It is that time of year when bright colored round fruits begin to show up in droves at the local supermarket. Hello boxes of clementines and bags of cranberries! Those little orange fruits are packed with citrus, which is exactly what everyone needs this time of year with fluctuating temperatures and heavy holiday schedules. 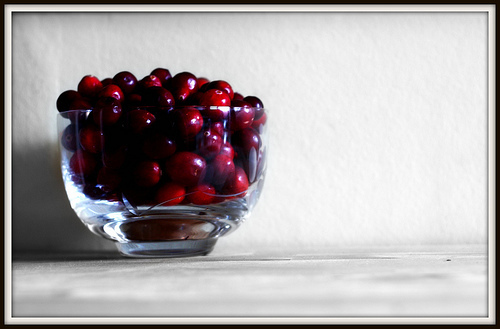 Have you ever strung up cranberries and popcorn? In addition to looking pretty and homemade it is a great group project while watching holiday films or animated specials. (**Maybe sprinkle a little maple sugar on the homemade popcorn you are consuming during the process.) This recipe is one we roll out every year around this time for holiday parties and entertaining for friends at home. Enjoy!! Bring water and syrup to a boil in saucepan. Add cranberries and zest. Boil gently for about 7 minutes or until sauce is thickened. Cool completely and refrigerate. Preheat oven to 350°F. 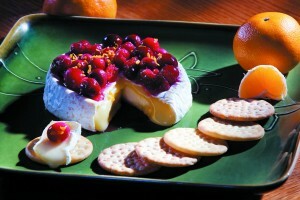 Unwrap Camembert and cut away large circle in top rind of cheese, leaving rind on sides and bottom intact. Slice in half horizontally. Spread sauce in thin layer in between halves, and on top of cheese. Bake on baking sheet until cheese just melts, about 20 minutes.